Take a guided tour of this iconic spaceport town in Star Wars™ Battlefront™ II and pick up some gameplay tips while you’re at it! Scorched by twin suns, ruled by Hutt gangsters, and housing many vile creatures, one might suggest that conditions on Tatooine are unforgiving. Rightly so. First introduced to movie-goers in Star Wars™: Episode IV - A New Hope™, Tatooine is where humble beginnings have ascended to greatness. Nowhere is that better demonstrated than with Anakin and Luke Skywalker, who both called Tatooine home and went on to form the fate of the galaxy. No doubt, this desolate desert world is a fascinating place. And today, we’re taking a tour of Mos Eisley, one of the two locations on Tatooine players can visit (the other being Jabba’s Palace) in Star Wars™ Battlefront™ II. Enjoy the sights of this intergalactic melting pot and pick up a few tips and tricks on the way. Just keep a low profile, will you? Available game modes: Galactic Assault, Blast, Strike, Heroes vs Villains, Arcade, Custom Arcade, and Hero Showdown. ”Our intelligence is monitoring a growing Rebel presence in Mos Eisley, and an U-wing is about to take off with assets vital to this pitiful resistance. We’re sending in troops to thwart this movement immediately! Our path through this dust bowl goes across the junkyard, cantina, and the market area. Deploying an AT-ST to cover the flanks will provide the heavy support necessary and pave the way for our elite soldiers to destroy the enemy transports.” – Unnamed Imperial officer, as told before a game of Galactic Assault on Mos Eisley. Burnt out podracer engines. Disregarded droids. Scraps from across the Outer Rim. Imagination runs wild thinking about the stories buried beneath the piles of junk in the northern parts of Mos Eisley. As the battle commences in Galactic Assault, don’t be surprised to see Jawa scavengers fleeing the scene. And peeking slightly to the south-east, you’ll also see the remains of the Dowager Queen – a crashed colony spaceship now a landmark of the city – towering over the rooftops. 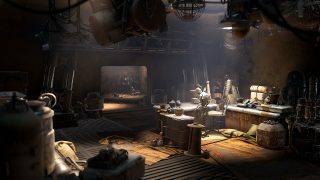 In Galactic Assault, the junkyard objective area is hosted inside a two-story building next to the lot. To arrive here “safely” (one could argue that Mos Eisley is never safe, especially with Rebels and Imperials in the midst of a non-friendly exchange of blaster fire), going down one of the different flanking routes might be a good idea for a couple of reasons. First, running straight at the objective will normally expose you to a lot of action, and thus, to a lot of risk. Second, by flanking, you’ll be able to defeat your enemies with the element of surprise. A myriad of possible routes makes up this bustling spaceport town, so be sure to explore different ones through its alleyways, buildings, and rooftops. Speaking of which, the rooftops provide advantageous upper-ground for long-range Specialists and other troopers alike, with some great placement options for the Officer’s blaster turrets. Keeping level verticality in mind will always aid your efforts in Mos Eisley! If you play as an Imperial, stacking up some early battle points to deploy the AT-ST near the junkyard is a sure way to gain an edge. With its heavy artillery, you can mercilessly cut out enemy reinforcements rushing towards the objective. Rebels can counter this by sneaking around the AT-ST and unleashing weaponry (preferably with the Ion Shot weapon modification attached) at its weak point – the hatch on its back – or making the skies rain fire upon it with an A-wing. Arguably, few locations are quintessentially more Star Wars than a Mos Eisley cantina with jazzy vibes and shady patrons. Though sharing similarities by both being bars in a dusty pit of a town, this isn’t the same locale Han Solo visited in A New Hope, but one a bit snazzier, and with a slightly different clientele. However, in Star Wars Battlefront II, the venue is emptied of customers due to, well, the raging battle. Yet, players with attention to detail can still enjoy some brief leisure with a cantina band in hologram form. Be careful not to spend too much time relaxing by the bar though, as you’ll be facing enemies approaching from all directions. Instead, consider taking cover within one of the archwayed booths on opposite sides of the tavern interior, and equip yourself for close-ranged combat. The Assault class’s Vanguard ability is notoriously efficient when wanting to settle the score while defending or attacking this position. Upstairs, you’ll find a terrace with a terrific view of the surroundings. Players can use the terrace as an alternative entry point into the building, either by the stairs or by dropping down the bar’s open ceiling. Or, use it as a lookout to pick off enemies running for the cantina objective – one of the most pressured combat areas in Star Wars Battlefront II’s Mos Eisley. Visiting the terrace at dusk, the setting of Tatooine’s twin suns is truly a sight to behold. If you decide to climb onto the cantina’s roof-dome, a common feature on Tatooinian buildings, you might even catch a glimpse of a sandcrawler chugging its way across the dunes. Sharing space with the occasional Ronto and Bantha, the zigzagging roads are crowded with merchants selling their goods. The heart of Mos Eisley’s trading culture, though, is the market area’s bazaar and auction house. In Galactic Assault, this is where the two capture points of the second phase are housed. Browsing the bazaar, you’ll notice a second level above the eastern entryway, with staircases on both sides. This platform – though not within the objective capture area – offers a good vantage point from which you can rack up eliminations. When contesting the area at the ground floor, ready yourself and find a good spot along the sides to cover your back as enemies will flow into the marketplace from all points of the compass. Over at the auction house, stacked boxes and wares provide cover both in and out of the courtyard. Scheming players might also prove victorious against their opponents by positioning themselves on the auction house roof, dropping down explosives through its openings. The only thing stopping you pulling off a cheap move like that is your own conscious, scoundrel! Hundreds of starship hangars are dotted around Mos Eisley, and the last phase of Galactic Assault narrows the combat down to a landing bay housing a Rebel U-wing. Here, Imperial troops must plant charges on the docked starfighter to stop the Rebels from leaving the area. Situated above this oval, open space, the control room acts as a crow’s nest and a popular area for Specialists to line up shots. If you haven’t spent your battle points on enforcers and/or heroes yet, now is the time. The extra firepower will be needed. Expect things to get really intense as both sides close in on this final stand on Mos Eisley. 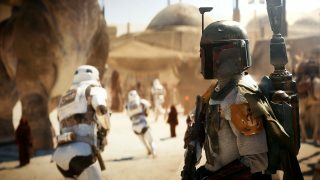 This article is part of our series, “Exploring the Locations of Star Wars Battlefront II,” giving additional context and gameplay tips for each location available in the game. Read about our previous excursion to Kessel, and check back regularly to learn more about other corners of the galaxy. 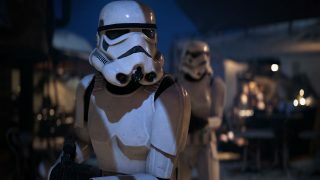 And as always, remember to keep an eye on this space for full coverage of Star Wars Battlefront II. 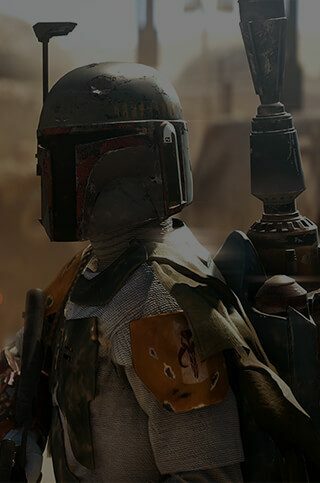 Also, sign up today to receive the latest Star Wars Battlefront II news, updates, behind-the-scenes content, exclusive offers, and more (including other EA news, products, events, and promotions) by email, and be sure to follow EA Star Wars on Twitter, Facebook, and Instagram, or join the discussion on the official forums.